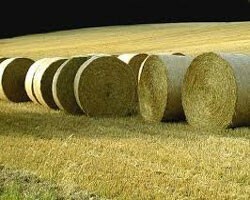 With lost hay this season from armyworms and dry conditions, and high purchased feed prices, more of the bale will need to be utilized. Large bales are a convenient form of hay for one-person operations. These bales can be moved, stored and fed relatively easily with the right equipment. Hay loss can occur when baling, moving and feeding and some is unavoidable. The biggest loss - both dry matter and digestibility - occurs with outdoor storage. Dry matter loss can reach 50% depending on the beginning quality, storage conditions and length of storage. It is not always realistic or practical to build a barn to store hay. Here are some tips to minimize waste from outdoor storage. Tightly wrapped bales tend to shed water better. The outer layer forms a thatch to reduce water infiltration. What helps with shedding precipitation is placing the bales lined up tightly together end to end. Pick a site that has good ventilation, away from hedgerows and wooded areas. This gives bales a better chance to dry out from air movement. And think about row spacing of at least 3 feet for good air flow and sunlight penetration. It's also a good idea to keep vegetation mowed between rows. Ideally, bales should be stored off the ground. Hay stored directly on the ground may lose up to 12 inches on the bottom of the bales due to wicking action. Find some waste material such as old fence posts, pallets or tires and place the bales on top. Gravel or stone may work too. Research was conducted by University of Tennessee animal scientists comparing different methods of storing large round bales of grass hay. The hay was cut and baled in June in Tennessee. The bales were weighed at the time of harvest and storage. Then they were weighed again the following January at the time of winter feeding. The following table lists the type of storage and the resulting percentage hay loss.